Budget Trouble, Budget Travel, Whatever...: Light my fire! 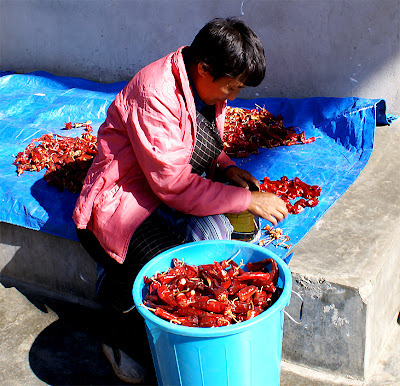 “Can you eat spicy?” my guide asked with certain trepidation. We were late for lunch and the standard tourist fare at the hotel restaurant was already gone. 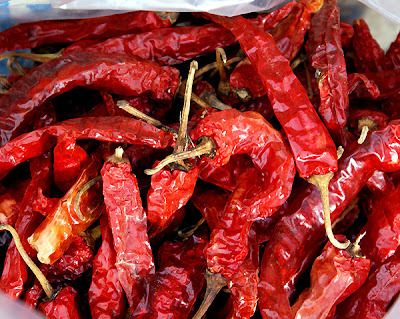 Can I eat spicy? Are you kidding me? My kimchee has been known to make native Koreans weep! “Duh! Sure I can!” But my guide was not convinced. “In Bhutan,” he began, and I noticed he had a curious habit of starting almost every sentence with those words, “in Bhutan, chilies are a vegetable, not a seasoning,” he explained, stressing the word not. 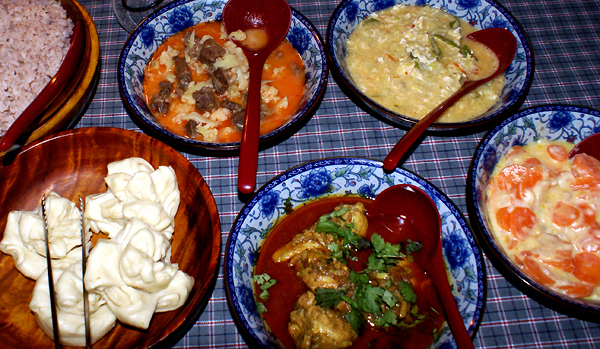 The most popular Bhutanese dish – ema datse – eaten for breakfast, lunch and dinner, consists of copious amounts of chilies smothered in a sticky cheese sauce. In fact, not only chilies come smothered in the ubiquitous cheese sauce. Potatoes, spinach, okra, carrots, mushrooms, and seemingly everything else, are fair game, too. To the amazement of my guide, I woofed down my ema datse (ema=chili, datse=cheese in Dzongkha), diluting it with large helpings of red rice. It was the hotel dinner buffet that evening that provoked my loud complaints. Spaghetti Bolognese, chicken cacciatore, sweet and sour pork. Even Swedish meatballs - no doubt requested by a group of Swedish tourists sitting at a table next to ours, who simply couldn’t survive without their national fare. They looked at me with unease. “But all the tourists eat that. They don’t like Bhutanese food,” my guide answered while staring at his plate of bja sha maroo (chicken with garlic and butter sauce), which oddly, was not available for the likes of me. “Here! We’ll share!” and with that, he scooped away half of my spaghetti, and deposited chunks of his chicken in its place. From that day on until the end of my trip, I was fed only local food. For breakfast, lunch and dinner. That included drinks as well. Apart from an odd practice of drinking warm, or boiling, water with their meals, the Bhutanese share with their Tibetan brethren a fondness for butter tea. Sudja, a milky concoction with a dollop of butter, and with salt instead of sugar, is not as vile as it seems. Thinking of it as the ultimate energy drink, Bhutanese style, helps the brew go down. At the Red Rice restaurant in Paro... nothing to write home about. My adventure with local cuisine ended abruptly in a little restaurant behind the Paper Factory in Thimphu. The place was a hole in the wall, lovingly adorned with photos of the Benevolent King (the handsome one) and the Crown Prince (the not handsome one). Dorji, the driver, who just a few days ago proclaimed that he couldn’t eat food WITHOUT chilies, because it had no taste, took a large helping of my lethal ema datse. His eyes bulged out in horror. “Tea!” Dorji yelled for the proprietor’s daughter, who doubled as our waitress. He made me drink the milky liquid until I regained my ability to speak. I couldn’t even taste its buttery saltiness.